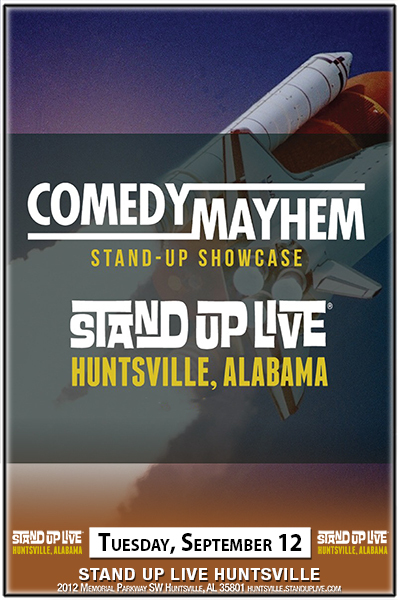 Comedy Mayhem is a stand-up showcase that displays Huntsville and the south east region’s best & brightest comedy talent. Each month 10 of the hottest up and coming comics will take the stage to show the audience their chops. Comedy Mayhem is hosted each month by Huntsville favorite, Jonathan Craig, who has worked his way up, over the past several years, from a local open mic comic to emcee. Come out for a fun night of shenanigans and support Huntsville’s awesome comedy scene! This months show features comics from Nashville, Memphis, Birmingham and Huntsville: Gary Fletcher, Tom Hand, Arky Shea, Tim Benton, Cortney Warner, Laura Peek, Tollie Jones, Ben Teichmiller, Doug Gillon, and Jonathan Craig.